F.E.I.S.= Faking Everything in Secret? May 7, 2008 Sharyn responds to a pro-Lowe's commentary published by Ted Universal in a recent issue of the Livingston County News. This commentary also appears in this week's newspaper [...]. Please Don't Destroy Geneseo (PDDG) is a citizens group founded in October of 2005 to oppose the proposal of Newman Development to obtain Planned Development District (PDD) zoning to build a 170,000 square foot Lowes on Rt. 20A in Geneseo. The PDDG File contains some of the documents concerning Newman's application and the circumstances surrounding the passage of the PDD law in July of 2005. Documents pertaining to PDDG's efforts to obtain additional public records about this matter which was the subject of an Article 78 lawsuit against Geneseo Supervisor Wes Kennison and the Town of Geneseo in May of 2007 are also available. Currently the Geneseo Planning Board is reviewing a Final Environmental Impact Statement filed by Newman. Public comments on the DEIS are also online. Welcome to The Clarion Call! 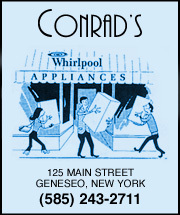 The Clarion Call Blogs were published by Clarion Publications, Inc of Geneseo, N.Y. 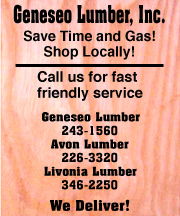 The blogs mainly reported on developments in the Big Box Battles in Geneseo and the Livingston County area and were discontinued when that fight ended in 2008. They are kept on line for historical purposes. If you are new to blogs read our blog FAQ. We formerly published the Lake & Valley Clarion weekly newspaper, which ceased publication in March of 2007. 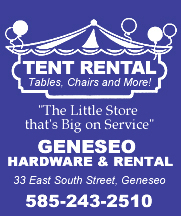 In prior years we also published Genesee Country Magazine and the Western New York Travel Guide. Much material from these publications is still available online. 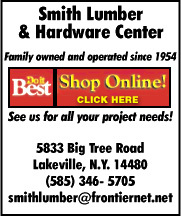 You can also help us by patronizing the Hometown Businesses whose ads appear on this site and telling them where you saw their ad! If you are interested in becoming a sponsor click here! Thanks for reading!